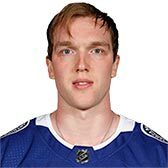 Andrei Vasilevskiy is 6' 3 and weighs 210 pounds. He is currently 24.8 years old. Is on the ice for practice. Is being evaluated for a left foot injury.